On Wednesday, a horrific mass shooting at a historically black church in Charleston, South Carolina brought the names of 9 victims and a suspected mass shooter into the American consciousness, a man who's since been charged with 9 counts of murder: Dylann Roof. On Friday, Gov. Nikki Haley openly suggested that Roof be given the death penalty if found guilty. 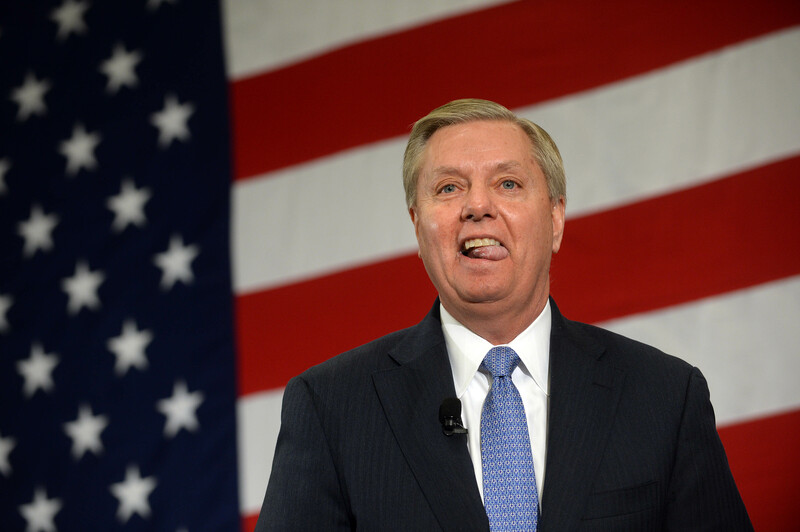 So here's a worthwhile question, considering a certain South Carolina lawmaker's lofty national ambitions — how does Lindsey Graham feel about the death penalty? Graham, a two-term senator from South Carolina, has certainly had a tumultuous few days of messaging since the shooting. In its immediate aftermath, Graham suggested that the attack may have been motivated by anti-Christian bigotry. But at this point, as detailed by CNN, investigators say the alleged shooter, Roof, has confessed that he carried out the mass shooting in an attempt to start a race war. Graham has since stated that "the only reason these people are dead is that they are black," as reported by The New York Times' Ashley Parker. But all the same, considering that this grisly attack could realistically culminate in a death penalty case, and it's right in Graham's backyard, it seems relevant to know where he stands on capital punishment. Given the magnitude of the horrifying incident, Graham's position on it could make or break the early stages of his presidental ambitions. Well, here's your answer: he's pretty into the death penalty, at least insofar as his voting record reflects. Back in 1998, while serving as a House Representative, Graham voted against an amendment which would have required life sentences to be applied instead of death if the court had any doubts about their guilt. Two years earlier, in 1996, he voted against maintaining habeus corpus rights in death penalty appeals. He also vocally supported trying death sentenced Boston bomber Dzhokhar Tsarnaev as an "enemy combatant." He is, to put it simply, a traditionally pro-death penalty Republican, cut from more or less the same mold you see throughout the party these days. That might not surprise you, given the prevailing climate on death penalty politics in the GOP — who could forget the thunderous applause Rick Perry's draconian death penalty record got during the 2012 primary debates? And obviously, Graham's opinion about the death penalty won't be the determining factor in whether or not Roof faces that kind of ultimate punishment. But it's useful to take the temperature both of the candidate, and the state from which he hails. South Carolina is one of the 31 U.S. states in which the death penalty is legal, and Governor Nikki Haley is also keen on the institution — she's already stated that she believes Roof should face capital punishment, and even if her state weren't able to administer it, the case could end up going federal if hate crimes charges are added.